Organic grapes are sourced from smaller vineyards in Italy to ensure a high quality and a great taste. The passion of the growers shines through, to make these wines fresh and ready to drink. With no unusual ingredients (you'd be surprised what some people put in wine!) they are also suitable for vegans. When we tasted the Fuoristrada wines we knew immediately that we'd finally found a TetraPak of the same high quality as the best bottled wines we sell... the fact that the Tetra Paks are ecologically sound has helped to make Fuoristrada one of our best-selling wines, but their success here really results from the wines being great value, and just plain delicious. 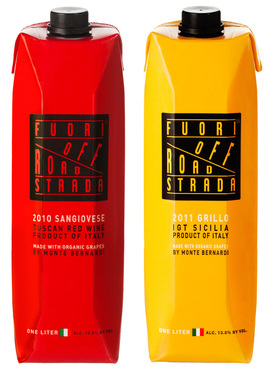 [Fuoristrada Sangiovese] breaks barriers in a way that prioritizes quality, price, and the environment. It’s innovative, ambitious, inexpensive, and quality driven. In short, the wine is great.